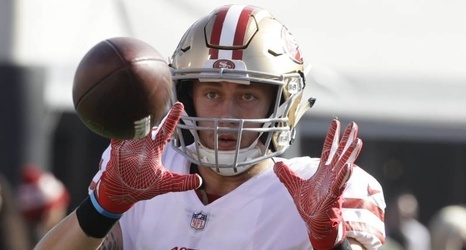 The San Francisco 49ers received good news about tight end George Kittle's shoulder after he left Thursday's preseason opener against the Dallas Cowboys in the first quarter. Per NFL Network's Ian Rapoport, Kittle's separated shoulder isn't considered serious after tests revealed no tears or structural damage. Kittle was injured when he landed on his shoulder after tripping over a Cowboys defender while attempting to make a catch. 49ers head coach Kyle Shanahan told reporters after the game he anticipated Kittle would "miss some time" due to the injury.